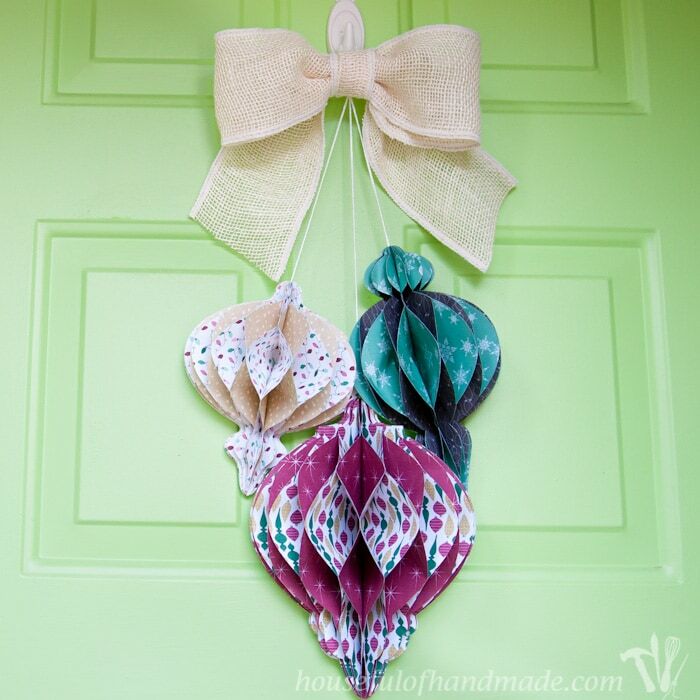 Decorate your door for Christmas with a non-traditional wreath: Giant Paper Ornaments! I am so glad to finally have this post ready to share with you! I have never had such a fight figuring out how to make something work. But the fight is sometimes what makes the end result so fabulous, right? I definitely did a little victory dance when I finished my wreath and it looked just like I had imagined. So today I am excited to finally share my DIY giant paper ornament Christmas wreath. I love creating a fun wreath for every season. It is usually the first decoration I put out as the season changes. This year I was having a hard time finding inspiration for my Christmas wreath. I could have pulled out a wreath from last year, but I just wasn’t feeling it. 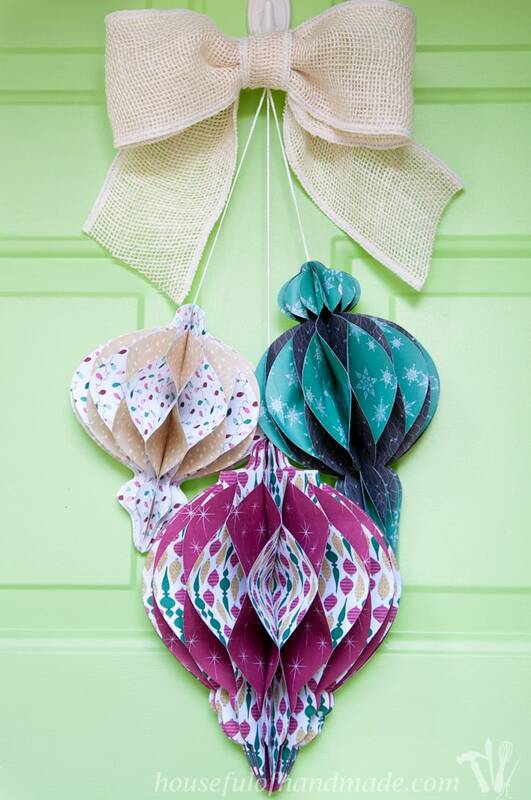 I was looking on Pinterest for some ornament inspiration when I came across a post from All Things Paper about the Anthropologie Christmas decorations from last year. Anthropologie decorations are always super inspiring and this was no exception. This giant paper ornaments were speaking to me. I want them all over my house! Maybe a few nestled into my Christmas tree too! I definitely wanted them to hang on my front door instead of a traditional wreath. 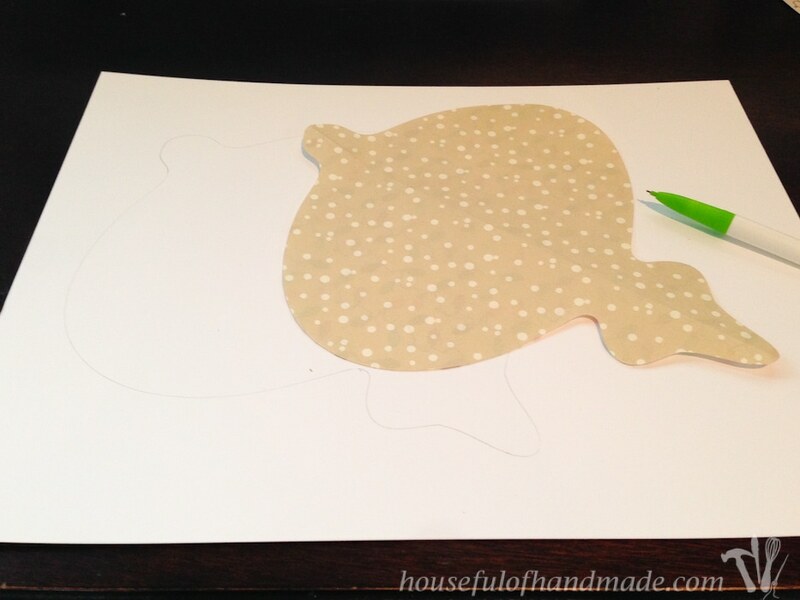 I started by making three different shapes for the DIY giant paper ornament Christmas wreath. I wanted them big so I made each ornament fill up an 8 1/2 x 11 sheet of paper (with a little variation so they weren’t all the same size). Then it was time to find some paper. I really wanted double sided paper so the design of the ornaments would pop, but I did not have any luck finding anything. So I decided to design some myself. I am so glad I did because the papers work perfect for my vision of the giant ornaments. 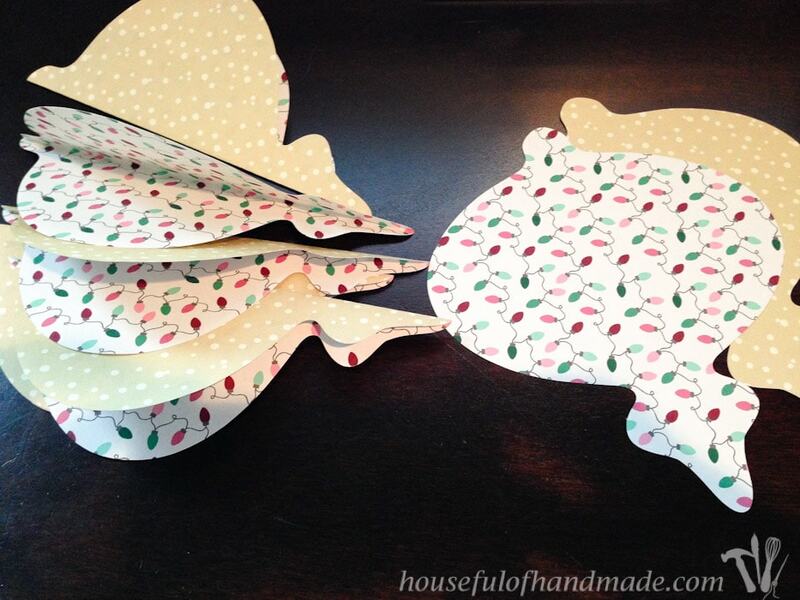 You can check out yesterday’s post to see the double-scrapbook papers I shared! To make each ornaments I needed 8-9 sheets of double sided paper. I started with 7, and the green/chalkboard ornament is made with only 7. But after making all three (and making one of them twice because it took me a minute to figure out the tricks to not getting confused) I learned a lot and you really do want more papers and more points stuck together to make the ornaments really have an accordion style with both papers peaking out. So I would plan at least 8 papers per ornament, but 9 is even better for the larger ornaments. I used my Silhouette to cut out my ornaments, but it’s not necessary. 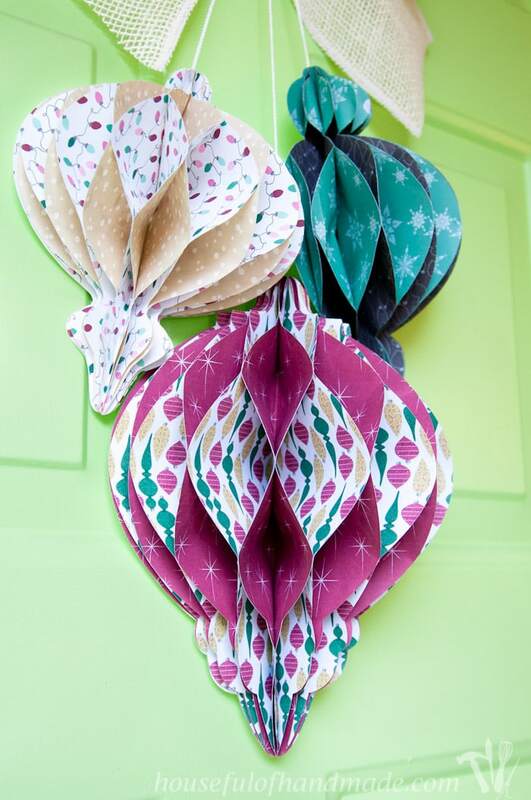 The ornaments are pretty simple and could be cut by hand while watching your favorite Hallmark Christmas movie. I created Silhouette cut files as well as PDFs of the ornaments for you to make. They are available in my library of free downloads that I share with my email subscribers. Click here to subscribe and get access to these files and so much more. I also included a template for where I put the glue (or for the long green/chalkboard one where I would put the glue if I were to redo it cause it was my first one) on the PDFs. 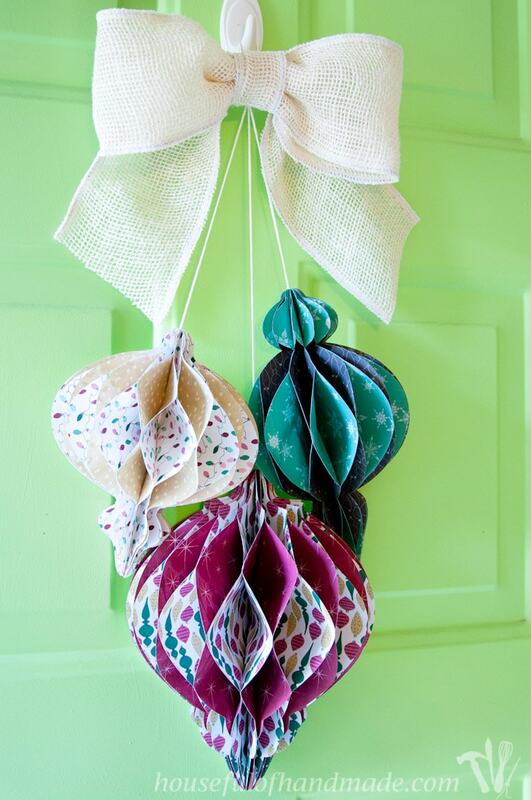 And if you love this creative paper wreath, you are going to love the new 7 Day of Paper Christmas Decor series going on now. Day 1 starts with Gingerbread House Paper Christmas Ornaments! I am sharing the template in my subscriber library. Click here to subscribe to my weekly newsletter and gain access to all the freebies. If you already have your password, click here to download them. 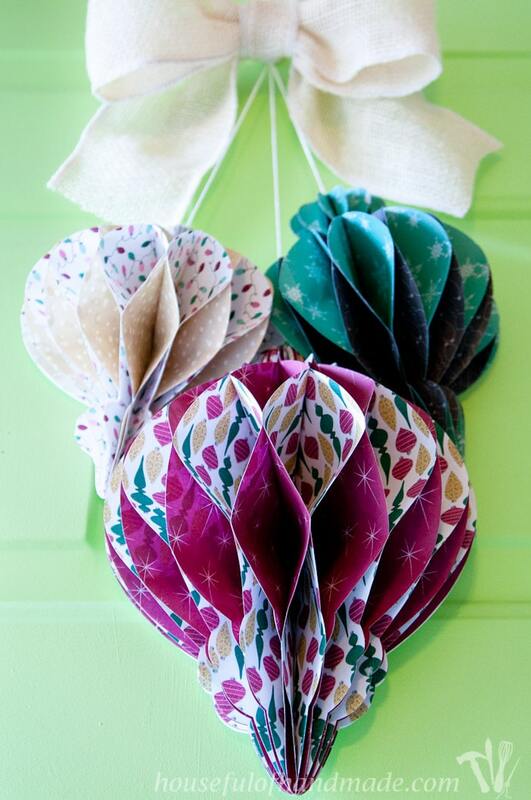 Start by cutting out your 8-10 papers per ornaments, then fold them in half. Make sure the same color is on the outside on all the papers. To make sure the ornaments stay flay on the back, I needed a stiff backing for them. I accidentally bought some 100 lb cardstock (also known as coverstock) instead of regular cardstock but it works perfectly for things like this. If you don’t want to buy some thick cardstock, you can also use an empty cereal box or something similar. I was having issues getting my Silhouette to cut the really thick cardstock, so I traced one of the already cut out ornaments onto the sheet of coverstock and cut it out with scissors. Make sure to keep the outside of the coverstock for the template to help keep your brain straight when glueing. To get me started on assembling my ornaments, I referred to this tutorial from Splitcoast Stampers. They used glue dots, but I didn’t have any of those and figured I could do it with my glue gun. I was right! The glue gun worked great, just make sure to use just a little bit of hot glue so you don’t accidentally glue all the papers together. 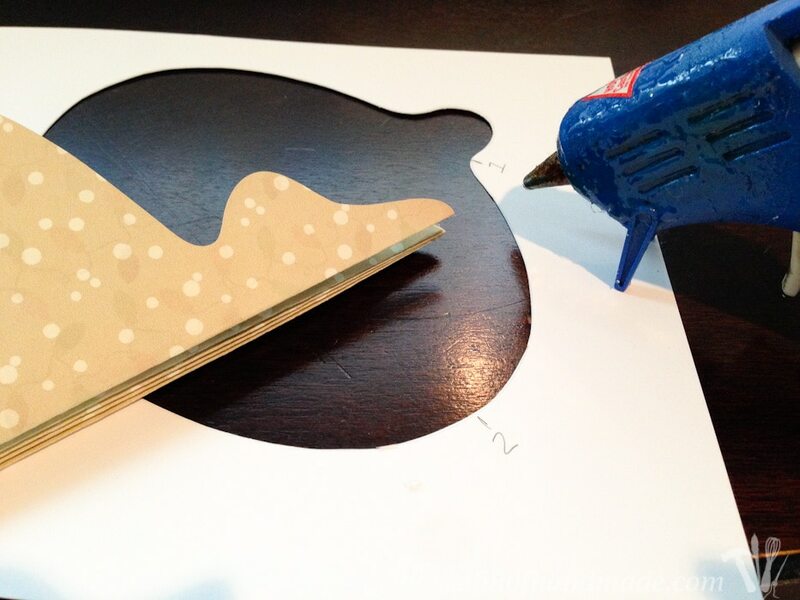 Using your template you will glue your folded papers together. This part got a little confusing for me so I am going to try to help you out. First, instead of just 1s & 2s on my template, I found it was easier to write the color or pattern of the paper on them so I never forgot what was suppose to be 1 or 2. The #2 glue areas went inside the folded papers and the #1 glue areas glue two different papers together. When putting the two papers together, I started with glueing the top and bottom tips of two papers together so they held still while I glued the rest. Keep glueing inside, then outside of all your folded papers. You will leave it all flat like in the picture. Once you are all done, give it a second to make sure your glue is totally solid, then carefully open it up to see your final ornament. You may have to stick your fingers inside the different sections to make sure it opens up the right way. Then you will want to glue the ornament down on your thick coverstock backing. One ornament down, 2 more to go! 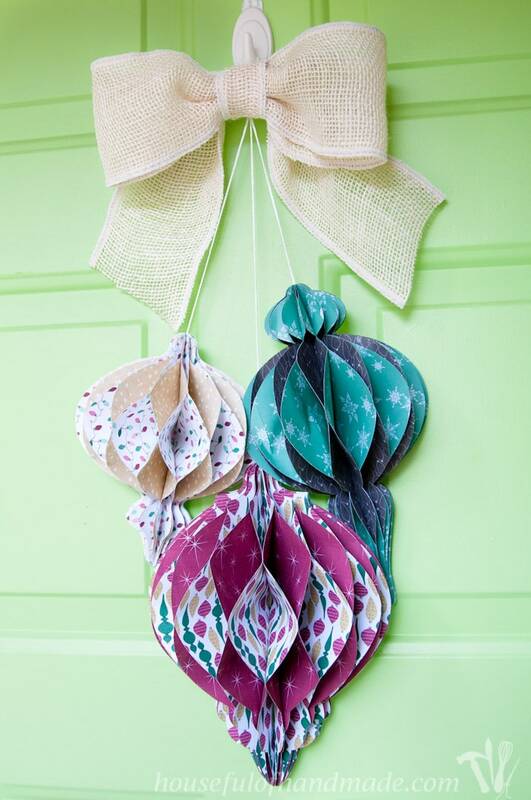 When all the ornaments were done, I glued a piece of small nylon string to the back of each ornament, then held them up against my door and adjusted the lengths until I was happy. I really am super excited with how they turned out! I am thinking I should definitely make some a bit smaller to hang on our Christmas tree. One last trick, the ornaments don’t stay perfectly flat against the door when it is opened and slammed shut over and over (our door is extra hard to close these days cause I just put on new weather stripping). My husband had the idea of double sided tape, but I thought I would put a magnet on the back of each of the ornaments since my door is metal. I have to go buy some still so I haven’t tried it yet, but I use magnets on the door all the time for the kids to play with so I hope it works like I imagine. I just love how they turned out. The fun texture and beautiful colors make me happy! And now our entry is finally decorated as festive as the inside of our house. Christmas is definitely the most wonderful time of year and we are having tons of fun celebrating by decorating. Decking our halls make me happy! And don’t forget to sign up to receive the weekly newsletter so you never miss a post and have access to my growing library of free downloads & printables. beautiful! 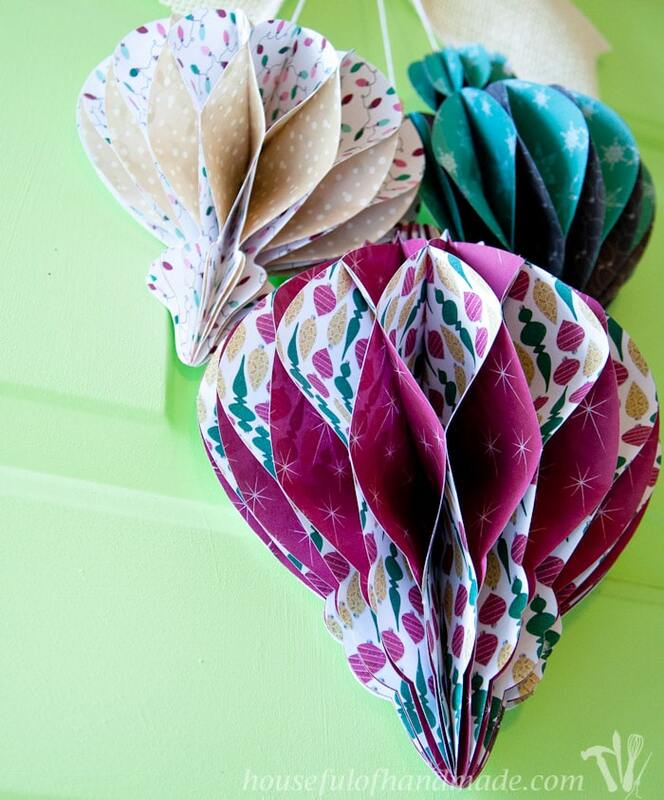 love these paper ornaments for a wreath! Just think of all the different colors/styles you could do for year round wreathing! These are so cute! Kuddos to you, I think I would get way too confused and give up lol. Thank you for sharing at Merry Monday! I thought about giving up, but I was way to invested. I’m glad I toughed it out. Thanks Amanda! This is lovely and so crafty! Thanks for sharing at Funtastic Friday! I love these ornaments. 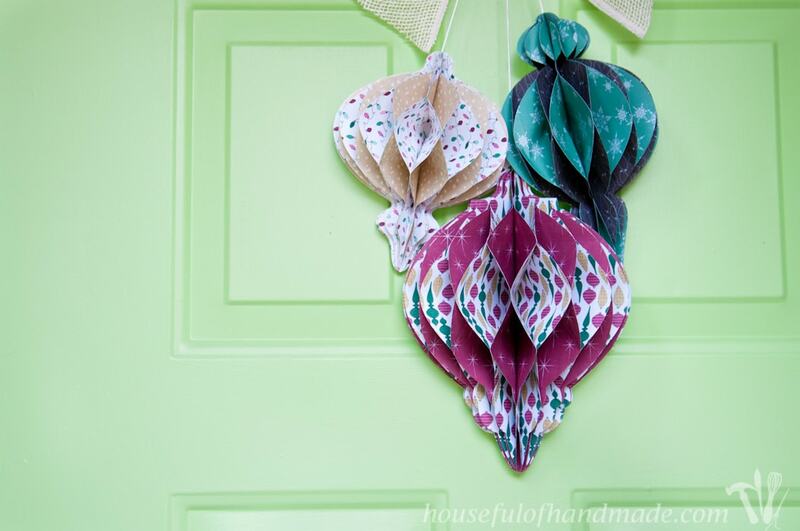 Just last Friday I came home with a pack of double sided Christmas paper I found at the craft store (and just couldn’t resist), it would be perfect for this! This is a gorgeous project! I’m definitely going to try this. I often find double-sided papers in Joann and Michaels craft stores. They’re not always printed sides though, sometimes solid on one or both sides. Thank you Deb! I thought about trying Joann’s but it is kinda far away. Silly I know. I hope you have fun making your wreath. So pretty!! I would love to have you share at my craft link party: http://craftymomsshare.blogspot.com/2015/12/handmade-christmas-craft-book-review.html! Thanks for stopping by, I’ll have to check out your party! What a wonderful idea and thanks so much for linking to All Things Paper! Thanks Ann! It’s amazing what you can do with just paper. What a completely fabulous tutorial! May all the joys of the season be yours. Love these! The paper you used is very pretty! I’d love to hang this on my front door 🙂 Pinning and tweeting to share! Thanks for linking up with us for Brag About It! How did you think of these!? They’re so big, awesome and worthy of a 7th-grade geometry lesson. I love the less traditional take on a front door wreath too! Sometimes I wonder where the ideas come from, they just pop up in my crazy brain. 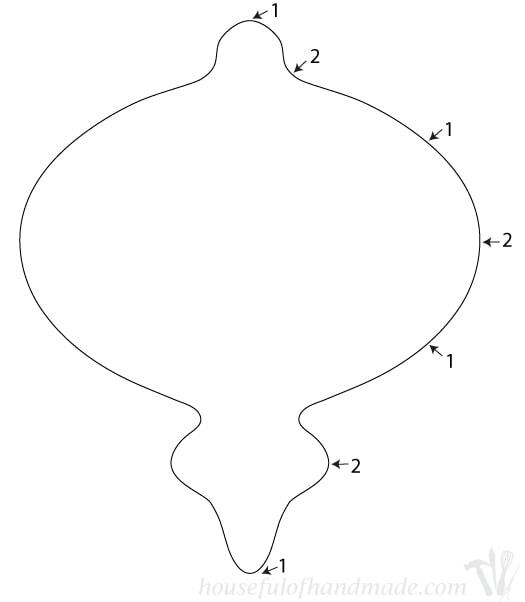 I wish I had a 7th grade geometry teacher to help me figure it out, maybe I would have had them done way earlier (like I had planned). Wow! That’s so pretty! Such a special wreath! I’m making one , but not for Christmas! For all year round! Hello Heaven! I love a classic wreath, but sometimes a little different is fun too. These are super fun for our door, I thought they could be fun on the mantle too. Thanks for stopping by.